The engine is easy enough to identify, although would someone like to supply the details ? The mystery is the location. Where was the picture taken? The background should identify it straight away. I believe that the location of the photo is at Rugby looking east. The viaduct in the background carries the Great Central main line over the LNWR. 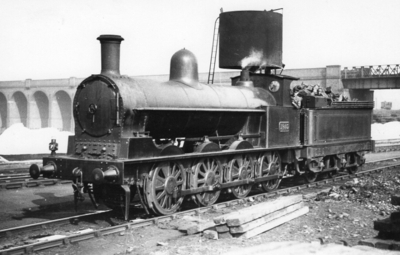 The locomotive is C class 0-8-0 No.1803. This was originally built as an A class 3 cylinder compound in October 1897 under Crewe works number 3808. It was converted to a class C simple in March 1906 and remained as such until withdrawal in November 1927 still retaining its LNWR number. It did not receive its allocated LMS number 8967. The photo may well have been taken after Grouping 1923-1927. The same photo is shown in "The LNWR Eight Coupled Goods Engines� by JR Gregory published by the Railway Correspondence and Travel Society in August 1950. In that publication the photo is credited to Locomotive & General Railway Photographs No.16953. Hugh's correct. The loco stands on one of the shed tracks. The picture was taken by Henry L Salmon August 1920. The LGRP number 16953 is correct, one of several hundred Salmon pictures that the company acquired.